Mandalay Entertainment Group chairman and CEO Peter Guber moved and engaged 400 business, political, media, and sports leaders as he talked about his leadership story and the importance of storytelling in business at the “ANC Leadership Series: Telling Stories Winning Games” forum held by ANC, the ABS-CBN News Channel, March 20 at the Sofitel Philippine Plaza Manila. Peter captured his audience right away, as he talked about the big role of failure in his success. He later shared how he was turned down many times before finally being able to acquire a team in the NBA, a move that TJ Manotoc – who hosted and moderated the forum – thought was also a big risk in itself as the Warriors team then was not doing very well in the league. Peter said they focused first on building a winning culture in the organization, where every member – from players, to coaches, employees, and even fans – believed in their goal and knew their role in achieving the goal. “When you create that culture, people bring in things. Everybody in the organization feel their participation. You have to meld them together and make them recognize the anthem of your team, your call to action. It is their team and we are the stewards. Culture is the best business plan for any company,” he emphasized. Peter uses the same approach in dealing with customers, who he prefers to call “audiences.” “When I look at them as an audience, I want to engage them, I want to get them to own the proposition not just hear the proposition. You must move your audience to the action you want them to take. You cannot move them with information and facts they will not be able to remember. People are not moved by features but the benefits the features render to them,” he explained. This is why, he said, storytelling is crucial for businesses. “When entrepreneurs and executives emotionalize their message, they give meaning that people can hold on to…We are not digital, we are analog, we are not moved by 0s and 1s, we are moved by oohs and aahs,” said Guber, who formerly served as chairman and CEO of Sony Pictures Entertainment, chairman and CEO of Polygram Entertainment, Co-Founder of Casablanca Record & Filmworks and President of Columbia Pictures. During the open forum, he was also able to share some insights on the entertainment business with his audience, which included Sen. Sonny Angara, US ambassador to the Philippines Sung Kim, South Africa ambassador to the Philippines Martinus Nicolass Slabber, ABS-CBN chairman Eugenio Lopez III, ABS-CBN president and CEO Carlo Katigak, ABS-CBN COO of Broadcast Cory Vidanes, and ABS-CBN Integrated News head Ging Reyes. Peter Guber, whose executive and entrepreneurial accomplishments have made him a success in multiple industries, has long relied on purposeful storytelling to motivate, win over, engage and sell. A practitioner of story, Peter wrote Tell to Win – Connect, Persuade and Triumph with the Hidden Power of Story, which shines a light on this powerful business tool. The business book became an instant #1 New York Times Bestseller. As keys to his own leadership and success story, Guber said his focus is always on building a good story, engaging his different audiences to believe and champion the story, and then rendering to those audiences meaningful and memorable experiences. He sums up his business technique with the acronym “MAGIC,” which means Motivating your Audience to your Goal, through Interactivity, and great Content. 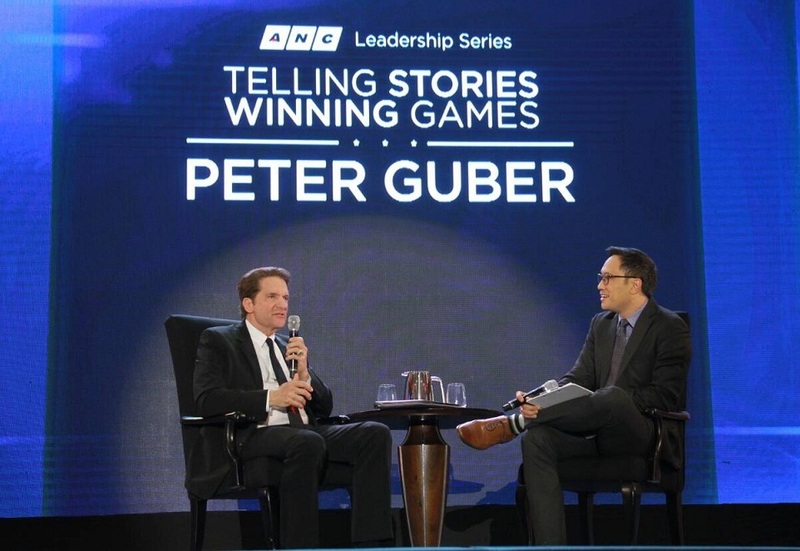 Peter Guber is the third featured speaker in the ANC Leadership Series, which began in 2016 with Virgin Group founder Richard Branson, followed by former US secretary of state Madeleine Albright in 2017. The ANC Leadership Series is part of the country’s premier all-English cable news channel’s efforts to raise the level of discourse on global affairs and business issues in the country by bringing renowned international speakers for a one-day speaking engagement. ANC will soon air TJ’s exclusive interview with Peter Guber. For news and information, watch ANC, your news channel, your partner on cable. Watch ANC in high definition on cable on ANC HD. You may also visit news.abs-cbn.com/anc or follow @ANCalerts on Facebook and Twitter.